The Harlem Renaissance was a deep-water era from which countless artists have since drawn inspiration. So too, Nikki Grimes whose latest collection, One Last Word: Wisdom from the Harlem Renaissance, includes poems not only from luminaries of that illustrious period, but also original poems by Grimes herself, who, via the Golden Shovel method, updates social issue of 1920s and ’30s Harlem for a 21st century readership. 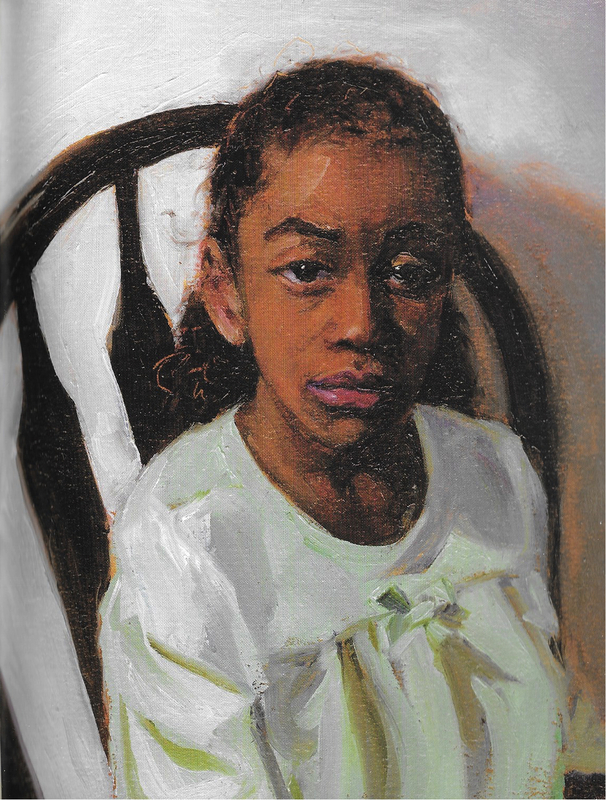 Borrowing lines from Langston Hughes, Countee Cullen and a score of other Harlem Renaissance poets, and pairing her poems with vivid, evocative artwork, Grimes’ collection is a fitting tribute to her cultural and literary forebears, while cementing her reputation as an adept children and young adults’ (and adults’) poet. And standing on the marble steps. seeking their hour in the undemanding shade. Ever searching, forever counting their steps. are molded from. Yes. Molded. Dreams do not come. disguised memories-to-be might rain down from above. The adaptability of both form and theme is part of what makes the golden shovel so attractive. Thematic differentiation serves throughout the book as a reminder that Grimes does not work for but with the inspirational poems she has selected. Which is often the whole point. The golden shovel is not only a way of honoring, but simultaneously a springing forth from other’s works. This duality, of course, is what One Last Word is all about. Grimes never fails to honor, but she refuses to be confined. Grimes is a self-professed poet for children and young adults. Her youthful audience is catered too tastefully throughout the book. From the simplistic descriptions that preface the collection—an overview of the Harlem Renaissance, definition of golden shovel, and poets’ biography—to the vivid imagery of young people appearing throughout the book. ours, right? We get to choose? Well, we choose life. my diagnosed dyslexia. Ask me to read aloud, I stress. most folks surmise that my head is hollow. Actually, it’s quite full. Given the personas represented in the six stanzas, it’s perhaps fitting “Crucible of Champions” would be considered a poem for juveniles. This assessment, of course, doesn't tell the whole tale. Educators, parents, and in fact any adult who wants to better understand the life of a young person, especially a young person of color, has a great deal to learn from the six people represented therein. That said, when Grimes herself claims that, though she began her career focusing on the adult market before shifting her “emphasis to literature for children and young adults” (page 1), the claim certainly has credence, but no reader should underestimate her work because it bears the label. The distance between juvenile and adult poetry is not so great as we might think. Anthony Fife: In the preface, you say that the poets of the Harlem Renaissance were among your earliest influences. Geographically, at least, that makes a lot of sense; you are, after all, from Harlem. But what about the work itself, regardless of geography, was so appealing to you as a child? 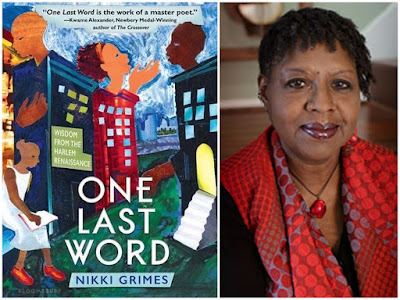 Nikki Grimes: I came to this work in my teens, during the early 60s, at the flashpoint of the Civil Rights Movement, the rise of the Panther Party, and the new slogan of Black Power. The poets of the Harlem Renaissance were addressing the very issues of racial and social injustice that we were wrestling with, at that time. Paul Laurence Dunbar's "We Wear the Mask" spoke to me. Countee Cullen's "Incident" was my own story. Waring Cuney's "No Images" and Langston's "Harlem Sweeties" ("Carmel, brown sugar/A chocolate treat") let me know I was comely even before the phrase "Black is Beautiful" was coined. Cullen's "Yet Do I Marvel" was the "Yes!" to my personal drive to write poetry in spite of the emotional wreck and dysfunction of my family life. To make a poet black, and bid him sing!" 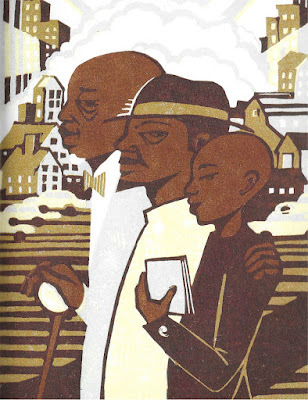 I still read Langston, of course, and I love to return to Georgia Douglas Johnson and Gwendolyn Bennett. And the language of Jean Toomer still plucks the strings of my heart. AF: How long after learning the Golden Shovel form did it take you to conceive of this project? NG: I had two ideas for projects immediately after writing my first Golden Shovel poem. I knew I wanted to do something with poetry of the Harlem Renaissance, specifically bringing it to an audience of young readers who might not otherwise appreciate its relevance. And I wanted to introduce readers to some of the female poets of the period they probably weren't familiar with. The other idea I had was to apply the form to an exploration of the Psalms. The Harlem Renaissance project ended up being idea I attacked first. AF: Is the golden shovel a form that, aside from One Last Word, you often use? NG: This form is relatively new, so I haven't had many opportunities to use it, yet, but I have written a picture book using this form. It's called The Watcher, and it grew from the lines of Psalm 121, one of my favorites. AF: What other forms are common or important in your work? NG: I love free verse, haiku, and tanka. These are forms I return to often. But I'm addicted to challenge, and so I'm looking to explore other forms, as well. Each form of poetry takes me places I wouldn't go, otherwise. AF: What are some of the challenges of golden shovel poems that differentiate it from challenges of other forms? NG: While other forms lock the poet in where meter is concerned, Golden Shovel forces you to use words that may or may not fit comfortably in your mouth, or in your psyche. If, for instance, you select your striking line from a poem written during another period in time, you may end up having to wrestle with language that is antiquated, or be stuck having to use a word that you would never encounter in current speech. In one of the Renaissance poems I chose, a striking line included the word "Chromatique." That was quite the head scratcher! What on earth, I kept asking myself, am I supposed to do with that word???? I ended up using it as the name of a hair salon. The other aspect of the Golden Shovel that's challenging is determining what your poem is going to be about, and then working out a strategy for using the words you've chosen to help tell that story. For me, it feels a bit like sculpture in that I don't know what I'm going to end up with until I get there. I just take my raw material—words—and keep chipping away until something coherent begins to emerge. AF: I notice that many of your original poems in this collection are persona poems. How does adopting the perspective of another, be they real or fictional, help shape the trajectory of your poems? NG: I'm a character-driven writer, and delving into character is most often my way into story, whether that takes the form of a prose work, a novel-in-verse, or a narrative poem. So character was also my default, here. When I asked myself, with each striking line I chose, "Now what is this poem going to be about? What story will I tell?" I turned to characters to suss it out. Once I climb into a character's skin and look at the world, or a given situation, through his or her eyes, my direction becomes very clear. AF: Indeed, several of your poems adopt a different persona from stanza to stanza. These are among my favorites in the book. Could you speak to the interplay of the one character to another to another aspect of these poems? NG: There is something about the dance between two or more characters that add energy and a certain dynamic to the narrative that I love. When I was developing as a young artist, I spent time in the theater, and I brought that sensibility into my writing. I'm forever picking up snatches of dialogue between strangers, and imaging interplay between characters long before they make it to the page. I can't help it. I love placing a number of characters in a space and then seeing how they interact how they impact or influence one another. I suppose that's why I keep writing multi-voiced novels like Bronx Masquerade, a novel in prose and poetry written in 18 voices. It's a kind of sickness, I suppose, but it's all mine! AF: In part because of the multiple personae in some of your poems, your work, on average, tends to be much longer than that of your literary ancestors. Whereas many of the Harlem Renaissance poems you exemplify in this collection are relatively brief (usually fitting comfortably on one page) yours is much more expansive. Could you please talk about that? NG: Well, by virtue of the form I've chosen, every word of every line I select from the original poem becomes a new line. On that basis alone, the minute I select more than a single line, the resulting poem is bound to be longer than the original, even more so in those cases where I've chosen to use the lines of an entire stanza. Then, of course, in the few cases where I used the words of an entire longer poem, well the growth is exponential. That's one answer. Beyond the above, I was seeking to expand the subject matter both to express the intent of the original poem more clearly for young readers, and to bridge the gap between their own point in time, and the period of the Harlem Renaissance poets. I want to make sure readers fully appreciate the relevance of the Renaissance poetry today. Sometimes, that requires a bit of expansion. AF: Did you have a relationship with any of the artist beforehand or were they and their work kind of brought to you by the publisher or something like that? NG: More and more books for middle grade readers are being illustrated, these days, and so I knew there would be some art, though precisely what form it would take was an unknown. When the text was complete, my publisher suggested that, rather than having a single artist illustrate the book, we might, instead, invite a variety of artists to do one illustration per poem. I thought that was a brilliant idea, and immediately agreed. I compiled a list of artists for the publisher to contact, and we went from there. Most of the artists have illustrated one or more of my picture books, over the years, or else illustrated my poems in various anthologies, so I was familiar with their work, and their artistic sensibilities. And, of course, I relished the opportunity to do one of the illustrations, myself—a first for me! AF: As the final question I always mention the title of the blog: Poetry Matters. Of course, it can be read as "stuff about poetry," but it can also be read as the bold declaration "poetry DOES matter!" Taking the latter as our guide, please explain to me why poetry DOES, in fact, matter. demonstrably poorer without poetry. Who would choose to live in such a world? Not I. New York Times bestselling author Nikki Grimes is the recipient of the 2017 Laura Ingalls Wilder Medal, the 2016 Virginia Hamilton Literary Award, and the 2006 NCTE Award for Excellence in Poetry for Children. 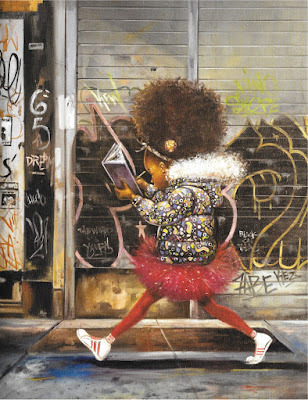 Her distinguished works include the much-honored books Garvey's Choice, ALA Notable book What is Goodbye?, Coretta Scott King Award winner Bronx Masquerade, and Coretta Scott King Author Honor books Jazmin's Notebook, Talkin' About Bessie, Dark Sons, Words with Wings, and The Road to Paris. Creator of the popular Meet Danitra Brown, Ms. Grimes lives in Corona, California.